October 7, 2017 (El Cajon) – Crowds flocked to Oktoberfests in El Cajon and La Mesa for bratwurst, beer, and festivities. The two community events differed sharply, with the German-American club’s event at its headquarters in El Cajon focused on authentic offerings such as a German band and Bavarian pastries, while La Mesa added some international elements and carnival attractions. August 14, 2017 (La Mesa) -- Celebrating its 44th year in 2017, the popular La Mesa Oktoberfest is going back to its roots to bring guests more entertainment, more vendors, more beer, and more "Prost!” (cheers!) than ever before, organizers have announced. Under the direction of the La Mesa Village Association, this year’s fest will showcase a revitalized and elevated experience for all ages on Friday, September 29th through Sunday, October 1st. Attractions include many vendors featuring craftwork and knick-knacks, foods ranging from scrumptious sausages to food truck favorites, live entertainment, beer and now, cocktails. February 9, 2016 (La Mesa) — The Mesa Village Merchants Association failed to pay back nearly $48,000 it owes to the city of La Mesa for the 2015 Oktoberfest, the San Diego Union-Tribune reports. Now the city has referred the debt to its collection agency. Arlene Moore, president of the nonprofit merchants’ group, told the Union-Tribune that the organization plans to repay the debt and hopes to continue hosting the Oktoberfest in future years. The situation has sparked controversy in the community, with some criticizing the merchants for financial mismanagement, while others find fault with the city for requiring full cost recovery for Oktoberfest and other public events. October 3, 2015 (San Diego's East County) - Oktoberfest is a big deal in East County. Locally we have many festivities that hit the mark when it comes to the traditional Bavarian celebration. But what is it all about? EL CAJON ZONED FOR CHICKENS THIS WEEKEND -- AT EL CAJON'S OKTOBERFEST CHICKEN HAT CONTEST THAT IS! October 6, 2012 (El Cajon)--El Cajon, indeed, will have chickens in their town – not just in ovens---but on hats! Where? Oktoberfest -- held this weekend at the German-American Societies of San Diego, Inc. facility on South Mollison. Read more about EL CAJON ZONED FOR CHICKENS THIS WEEKEND -- AT EL CAJON'S OKTOBERFEST CHICKEN HAT CONTEST THAT IS! September 27, 2012 (El Cajon) -- For fans of Oktoberfest in El Cajon, festivities will run September 28, 29 and 30, and again October 5, 6 and 7 at 1017 S. Mollison Avenue. Come and enjoy authentic German food and a variety of German pastries. September 6, 2012 (La Mesa)—La Mesa Chamber of Commerce invites you to join in kicking off the biggest community event in the region - 2012 Oktoberfest. 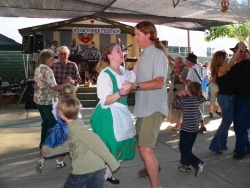 The three-day Oktoberfest annually brings in over 200,000 people to La Mesa. The Chamber’s preview kick-off will be held September 12 from 5:30 p.m. - 7:00 p.m. at Continental Catering, 8238 Parkway Drive, La Mesa. This event is free to Oktoberfest volunteers. Chamber Member & all guests pay $10 per person. September 18, 2011 (El Cajon) --The German American Societies of San Diego, Inc., hosts its traditional Oktoberfest on the first two weekends of October. Festivities will be held at the Societies’ headquarters at 1017 South Mollison Avenue in El Cajon. October 2, 2010 (El Cajon) -- The public is invited to an Oktoberfest celebration at the El Cajon Elks Lodge, 1400 East Washington Avenue in El Cajon, for the Elks' annual Oktoberfest on October 16, 2010 from 11:00 a.m. until 6:00 p.m. There will be food and beverages, craft booths, German music to enjoy, a nail pounding contest and pitcher holding contest along with drawings for many prizes. September 29, 2010 (El Cajon) –The German American Societies presents the 39th annual Oktoberfest in El Cajon over the first two weekends of October, the 1st – 3rd and 8th – 10th, 2010. Hours of this traditional, family-friendly festival are Fridays from 5:00 to 10:00 PM, Saturdays from noon until 10:00 PM, and Sundays from noon until 9:00 PM.